The Butterfly Skills junior table tennis bat has been chosen the perfect bat for improving table tennis skills in the ETTA Skills Programme. It is equipped with a 5-ply junior-size blade and features an elegant and comfortable flared handle with the ITTF approved rubber sheets. Additionally, the bat comes with a 1.5mm Panasia reversed rubber, the Butterfly protective edging tape and a colourful front label. Handle suitable for smaller hands. ITTF approved Butterfly Panasia reversed rubber with 1.5mm sponge. Endorsed as the Butterfly's leading bat for the school and recreation market. 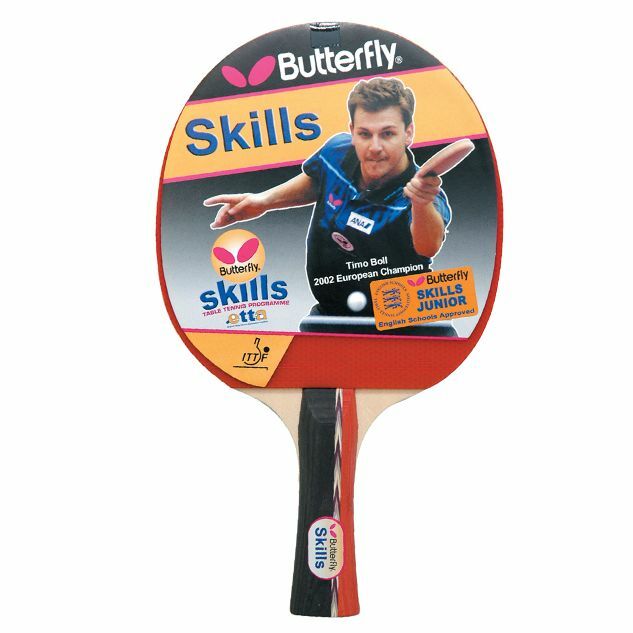 for submitting product information about Butterfly Skills Junior Table Tennis Bat We aim to answer all questions within 2-3 days. for submitting product information about Butterfly Skills Junior Table Tennis Bat. We aim to answer all questions within 2-3 days. If you provided your name and email address, we will email you as soon as the answer is published. for submitting product review about Butterfly Skills Junior Table Tennis Bat.